When Meghan Dougherty started playing roller derby in 2007, she learned much more than how to ride on eight wheels and knock into players. The Montclair resident and mother of two discovered the strength and fierceness it brings to women. Roller derby began as a subculture of punk rock skaters. Unlike most sports, it welcomes all body types. Big hips that might be considered negative otherwise become powerful threats on the rink. Dougherty, aka “Undertaker’s Daughter” for being the daughter of a mortician, started to consider how the sport can help young girls who are often teased or feeling pressure to be “pretty” and “cool” during middle school years. She started considering the idea of a book. At the time, Dougherty’s friend and illustrator Alece Birnbach, also a Montclair resident, had been creating images of girls and women with jokes for party napkins and decor. When Dougherty approached her to discuss a possible book, Birnbach jumped on the idea. She had seen little to no marketing toward young girls in the illustrating world. The two, along with co-writer Karen Windness, came up with Dorothy’s Derby Chronicles: Rise of the Undead Redhead, which will be released July 8. The book follows the life of Dorothy Anne Moore, aka “Undead Redhead” on the roller rink—a character inspired by a younger Meghan Dougherty. She is 11 with a medium build, green eyes and unruly orange pigtails. “I had a blast coming up with what she looked like because I imagine Meghan’s hair was out of control and a lot redder,” Birnbach says. She describes Dorothy as Lucille Ball-like with clumsy tendencies. Dorothy starts playing roller derby because of her grandma, a pink-haired, hearse-driving woman and retired roller derby star. Dorothy falls into a wildly unique and supportive group of girls, a blessing as she enters the often-awkward “tween” years. The book chronicles the team’s ups and downs on their way to the championship. Dougherty says she would’ve liked to have this book and the sport when she was younger. Growing up with brothers, she was always wrestling and often mistaken for a tomboy, but still liked pretty things. “It’s not that we don’t love a good princess book, but we also like the anti-princess, the girl who’s just going to be herself,” Dougherty says. “Even the prissy girl in the book turns out to have a pretty rough side to her. Roller derby gives that opportunity to her,” Birnbach adds. 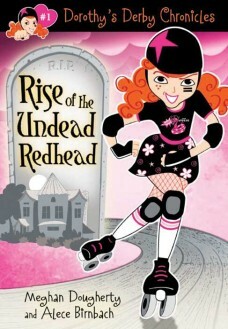 Rise of the Undead Redhead is the first of the Dorothy Derby’s Chronicles. The creators plan to publish up to 10 books, with the second coming out spring 2015. Through July 7, people can preorder the first book and save money on the Tattered Cover, Amazon and Barnes & Noble websites.